Britta Baechler (right) looks at harvested razor clams. 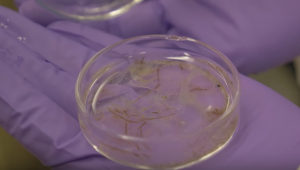 A new video from Oregon Sea Grant shows how researchers at Portland State University are inspecting the guts and tissues of razor clams and oysters along the Oregon coast for microplastics, which can come from foams, tiny beads in facial creams, synthetic fibers from clothing, and disintegrating plastic bags. An oyster is shucked at a lab at Portland State University. “Our goal is to figure out if we have them in our oysters and clams, and if so, are they at problematic levels?” said Britta Baechler, a PSU master’s student who is working on the Oregon Sea Grant-funded project under the guidance of PSU marine ecologist Elise Granek. Oysters and clams, Baechler explained in the four-minute video, are indiscriminate filter feeders and so they may ingest a piece of plastic and not be able to get rid of it. Microplastics, which are defined as less than 5 mm, are of concern because they can attract chemicals, which might harm animals if eaten. Britta Baechler shows a dissolved razor clam in a Petri dish. With help from the Oregon Department of Fish and Wildlife, Baechler dug up razor clams at nine sites along the Oregon coast and bought oysters at five locations to see if there are areas where microplastics are more prevalent. 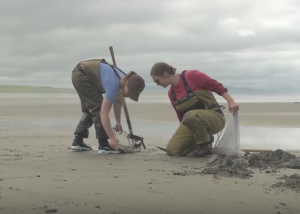 She collected the shellfish in the spring of 2017 and again this summer to see if microplastics are more common during certain times of the year. Once the oysters and clams were gathered, they were taken to Granek’s lab at PSU where they were measured, weighed, shucked and frozen so they could later be dissolved in potassium hydroxide. This process leaves a clear liquid that contains only sand and any plastics that may be present. The researchers hope to have dissolved all of the bivalves by the end of September. For the ones that have already been dissolved, they’ve been analyzing the liquefied remains under a microscope to see if they find microplastics, but results are not in yet. Photos of Baechler and her work can be downloaded from this album on Oregon Sea Grant’s Flickr page.